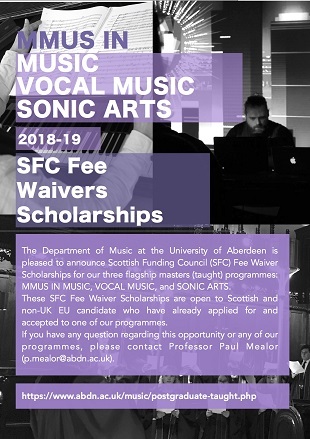 The Department of Music at the University of Aberdeen is pleased to announce Scottish Funding Council (SFC) Fee Waiver Scholarships for our three flagship masters (taught) programmes: MMUS IN MUSIC, VOCAL MUSIC, and SONIC ARTS. These SFC Fee Waiver Scholarships are open to Scottish and non-UK EU candidate who have already applied for and accepted to one of our programmes. If you have any question regarding this opportunity or any of our programmes, please contact Professor Paul Mealor (p.mealor@abdn.ac.uk).